Manufacturer of a wide range of products which include chapati dough ball making machine, chapati dough ball cutting machine, khakhra dough ball making machine and khakhra dough ball cutting machine. Voltage 0.4 kW / Hr. Dough Ball Weight 20-50 Gms. Electricity Consumption 0.4 kW / Hr. 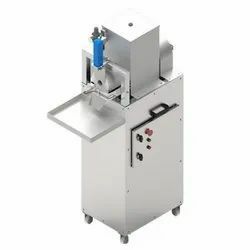 Khakhra Dough ball making machine by Qualimark is a highly sought after product in the food processing industry that fastens up the process of making dough for chapati, poori and other flatbread in bulk. The machine is easy-to-operate and clean and can be customized to control the size of dough balls as per the requirement. With smooth dough ball cutting and easy-to-integrate mechanism, the machine promises a great boost in the productivity of existing operations without hampering current processes. 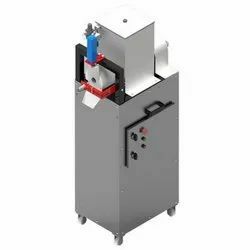 Developed, designed, engineered and produced using high-grade raw materials and latest technology, the machine is an efficient, durable and functional product, essential for every commercial kitchen. The dough ball making machine can be easily integrated to other machines like Qualimark’s Khakhra making and chapati making machines. This helps the operator in getting rid of the hassle of dough ball making. Also, the machine is made from precision and premium PP material worm that homogeneously mixes the kneaded flour for best-quality dough balls.